6-9 pm on the 2nd Friday of almost every Month. Please RSVP! We need to know how much food to prepare! Sargent Socials are a monthly lecture/dinner series each covering a different topic. Socials are held in the Sargent Equestrian Center Show barn, rain or shine. Come join us for dinner and excellent information from some of your favorite horse people and friends! There are numerous rule changes implemented by the American Driving Society (ADS) they year. Thomas will present a brief overview of some of the new rules. Read your ADS Rule Book, and understand which rules affect you and don't end up with senseless penalty points. Don't miss the Navigator Clinic on Saturday, July 19th. Is your horse really "okay" when something seems a bit "off"? 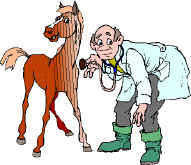 Learn how to take your horses temperature, pulse, respiration (TPR's) and other important information critical in deciding to wait it out or to call your Veterinarian. Learn what these values mean to your Vet and for your horse's health and well being. Fun competitions, Demo's, Seminars, Food, Friends, & Horses! (Big or small)! Draft Horse Days is open to the public, the barns are open displaying the history of days gone by, blacksiths are working in the restored blacksmith shop, teamsters are hooking horses to farming implements, carts, wagons and carriages. Often a ride is available to the public. There are seminars, contests, and good food. The Lions Club sells lunches and there is homemade ice cream, there is a $15 per person extraordinary barbeque prepared by Tom Pigg for the Lions Club. This year the guests will be entertained by a cowboy poet. Sunday is breakfast for the teamsters, Church and more horses driving and riding. Rain does not stop us!! Red Top has sandy soil, so even after a rain, the puddles are absorbed quickly. Please join us.